System Tropf Blumat waters your plants individually based on their needs. It measures the moisture level deep in the soil close to the roots, and reacts upon the moisture there. 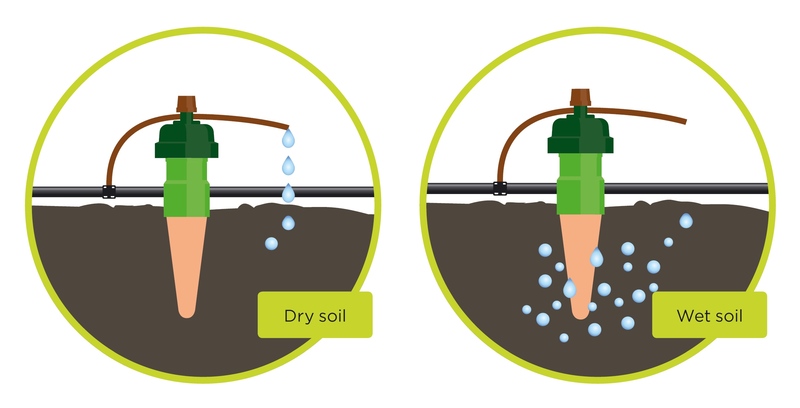 If soil is dry the dripper starts slowly to deliver water. The more dry the soil is the more water is being dispensed. As soon as the optimal level of moisture is achieved the water dispension stops by itself. Tropf Blumat takes into account sunshine, rain, air humidity and individual needs of plants during different phases of their growth. This video can also be watched at www.youtube.com/watch?v=UWPLr0Selh8. Each Tropf Blumat unit is sensor and dripper at once. The power of dry soil to soak water out of wet matter causes a lowering of the pressure in the unit. The integrated membrane in the head of the unit transforms that vacuum into a reduced pressure onto the drip tubing. The pinch off releases, water starts dripping out. After a while of dripping soil becomes sufficiently moisture and the ceramic cone soaks back water from the soil surrounding it. The vacuum in the units head disappears and the drip tubing is being pinched off again. Water stops dripping. No external cable, no source of electricity, no programming is required for making the system work. The right level of humidity for each individual plant can be modified by the adjustment bolt on the units head. Once adjusted Tropf Blumat works entirely unattended, it doesn't require any changes any more. Maja Popielarska in her program "Maja w ogrodzie" has presented, how Blumat works. Movie you can watch here.